Live Piano music Thursday, Friday and Saturday evenings. 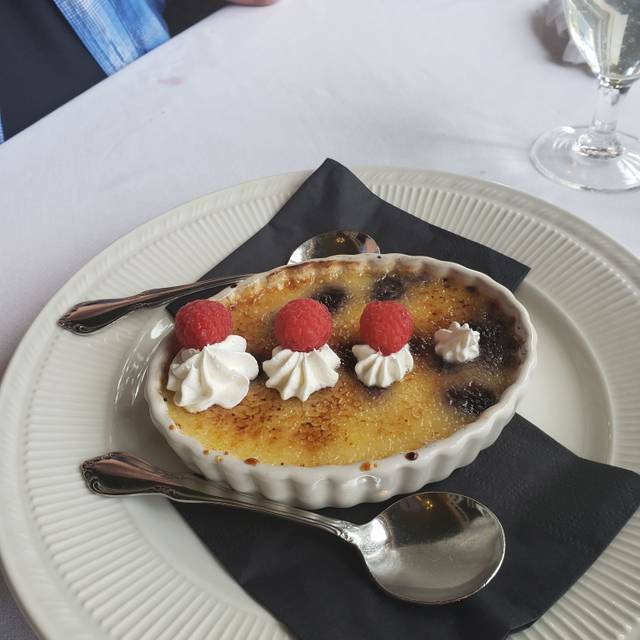 Casual, romantic and unobtrusive with the legacy of 1920’s elegance, Simon’s at the Columbia Gorge Hotel & Spa offers Northwest American Cuisine with a flair of Europe. Our high-quality meats and cuts from the local R-Ranch are impressing our discerning guests with a unique flavor and tenderness among other gourmet dishes and fresh salads. We promote the best that the Pacific Northwest has to offer, including its produce and wines. 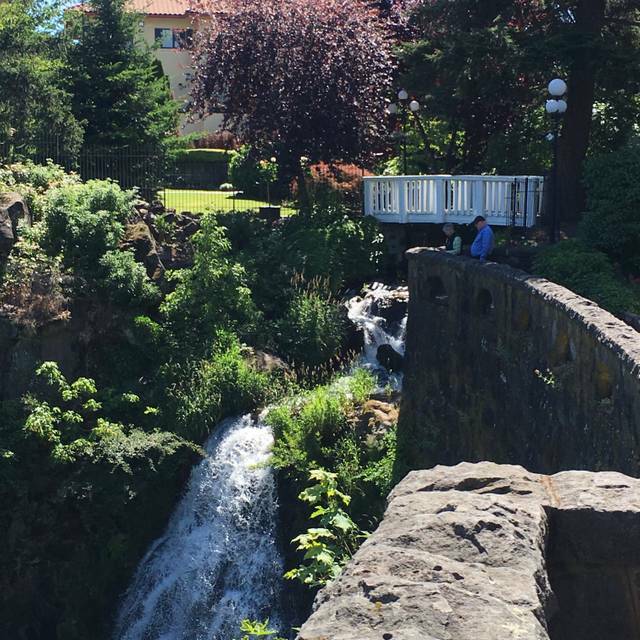 Surrounded by enchanted gardens and lawns, a dazzling view of the Columbia River, the Gorge and our own Wah Gwin Gwin Falls, Simon’s is definitely worth the trip to enjoy its every aspect. Simon’s Cliff House is open for breakfast, lunch and dinner along with its renowned 7 course Sunday Brunch and the daily Happy Hour at Valentino Bar. A little spendy for the average eatery customer but worth the experience at least once in ones life. The view as we ate is worth a good share of the cost. It took 45 min for us to receive bread. We asked to move a table after 40 min when one became available at the veranda. After that the food came. My husbands lamb was raw so we had to send it back. The waitress did take it off so we didn't have to pay for it. My daughters pasta came with sauce on top when we clearly asked for it to be on the side. I also asked for extra bread and was charged $2 for it which was odd. It also looked like there was 1 waitress on staff that evening so that might explain it. Underwhelmed at best. Beautiful views, excellent service and delicious breakfast! We had a wonderful, romantic, and delicious birthday celebration for my partner and love. Our reservation at the window was perfect. Tim, our waiter as attentive but never overbearing. He asked lots of questions and offered suggestions. The meal was exquisite and the service made it a memorable evening. We dined for the Sunday Brunch. I felt the menu didn't match what we received. It used terms like "variety", and I think I read "endless" which lead me to believe there might be a station or location to choose what danishes, muffins, scones, fruit, cheese etc I would want to have. This wasn't the case. They delivered 2 scones, 2 biscuits, some cheese, and some fruit. This didn't feel like a large variety. I ordered an omelet which contained a lot of oil underneath it. The side potatoes were not oily or greasy, which was odd that the omelet was. For the cost of the brunch, and the way it was advertised, I felt the delivery was pretty underwhelming. Nice for a special occasion. Salmon sandwich was good. 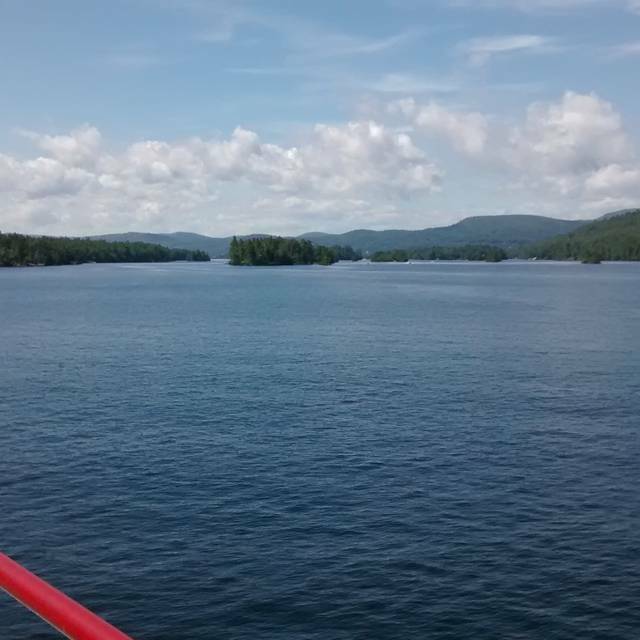 Slow service but you can enjoy the spectacular view while you chill. Food was just ok. Place is great. I'd stay at the hotel but eat first. My boyfriend and I went here for Valentine’s Day 2019. It was absolutely amazing. They even gave me a rose at the end of the meal. My boyfriend ordered the salmon and I got the chicken. 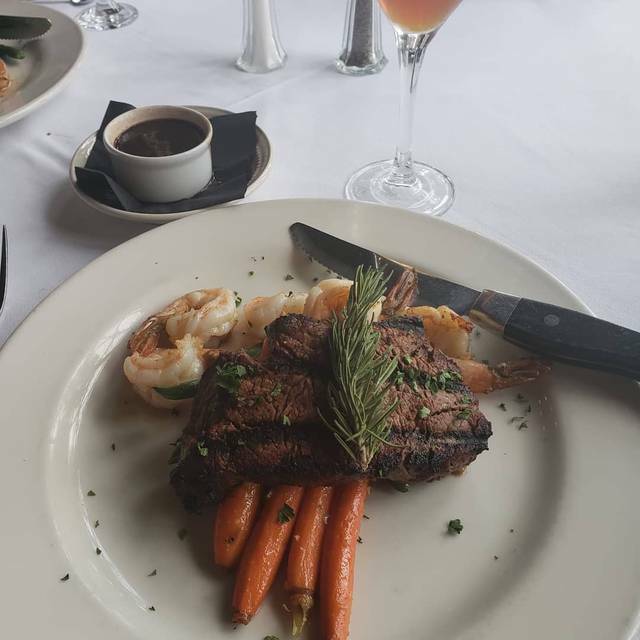 Each bite of both entrees were incredible. The restaurant’s menu is a little pricy, but it’s worth it because of how good the food is. The reason why I put 3 stars for service is because there were only about 5 couples in the whole restaurant and it took the waiter awhile to fill up our water glasses each time. For dessert we ordered the carrot cake and passion fruit crème brûlée. Both were amazing. This is by far THE BEST place to eat in hood river if you want a good meal. This is also my now, new favorite restaurant! Food tasted great. Gabriel and Cosette we're very attentive and hospitable. Old school, in a good way. Setting is gorgeous. Service was impeccable. Good wine list with moderate prices. Food is good but sort of old fashioned, e.g. lots of sauces. Went out of their way to accomodate my wife who has celiac disease. Outstanding lunch! The ambiance of the old majestic hotel is worth the trip but the food was delicious and the service was over the top!!! This was an amazing find. 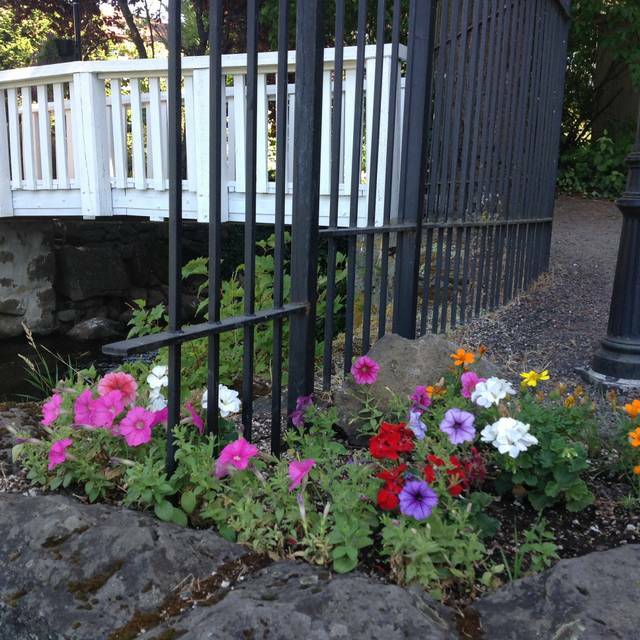 We were staying at the Columbia Gorge Hotel (a great place for a romantic river-view room), where Simon's is located. One section of restaurant looks over the Columbia River. It was a decade birthday stay, so we wanted something special. He started with a sweet potato curry soup and followed with scallops with wild rice and a mix of root vegetables. Her's was a basel-tomato soup and then river-caught salmon (steelhead?) with wild rice and brocolini. All washed down with a very acceptable house champagne. We are both pretty picky about food quality and both meals far exceeded our expectations. We didn't have much room for dessert, so shared a flourless chocolate cake that was truly decadent. Other dessert options also looked delicious (bread pudding, creme brulee, a chocolate cup filled with white chocolate mousse), all made in-house. One big shock was the price -- $120 including a generous tip for Gabriel, our waiter; how can they charge so little for such a fine meal? Breakfast menu was hard to choose from, ending up with eggs Benedict and French toast, fresh squeezed orange juice, fruit, and coffee/hot chocolate. All were excellent. The Sunday brunch is legendary, and if the normal breakfast is a clue, would be worth a special trip. We'll stop here again, for sure. We were greeted by the host with the statement that the wait staff was short handed (likely due to "Christmas Flu"). The starters for the fixed menu were different from that on the website. Soup spoons were not provided. We had to ask for bread, even though "bread service" was spelled out at the top of the list of mains available on the fixed menu (eventually) handed to us. The main was of adequate quality, but the side vegetables were barely warm. While our (over committed) waiter seemed proficient enough, it was amateur night as far as his support staff was concerned. This was our third visit to Simon's Cliff House and we have been underwhelmed all three times. It is unlikely that we will return. Our dining experience was a good one. The prime rib was not the best we have had, however, the courses that preceded it were creative, tasty and a joy to the palate. We also understand that serving that many people on Christmas Day is a challenge and we look forward to returning to sample the chef's offerings when there is not a set menu. The ambiance was quiet pleasurable and comfortable. Thank you for providing a wonderful Christmas dinner for my Mother and me! Stayed at the hotel for a weekend getaway with my husband and baby. Went to the restaurant for dinner. It was wonderful and the food was delicious. The staff was friendly and very accommodating with my 7 month old. 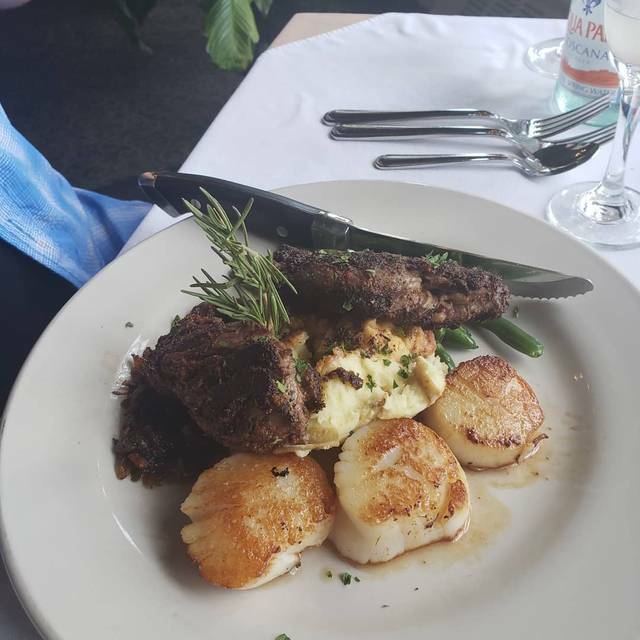 The scallops were the most memorable part of the meal for me. Beautiful view and delicious breakfast including local fresh fruit at a very reasonable price. The wait staff were attentive and friendly. We enjoyed a wonderful breakfast. Thank you! I had dinner alone and it was so very comfortable and delightful. A great menu, reasonable prices and terrific ambiance! With a stunning view, this old beauty is a wonderful place to have a quiet brunch. The brunch is substantial and yummy! Service great. Food was just ok for the price. I ordered a $40 rib eye steak. It didn't have any seasoning on it. And it sure wasn't the best steak I ever had. The fingerling potatoes and root veggies seemed like they were from yesterday. Dried out. Great food staff and service I will highly recommend Simons to my friends and family. Overall, had an enjoyable evening at the Cliff house. The view is beautiful, the restaurant is quiet and the food is quite good. The hotel and dining room is charming (from the 20s), but it's in need of a makeover in the not too distant future. I would dine here again. our food was good - the service could be improved. it took until after salads to learn the bar did not have the ingredients for the cocktail ordered. Wrong salad brought to one person. Server couldn't remember which meal went to who. As soon as dessert was delivered, the bill was left and we were never asked if we needed anything else. Our table was next to the door to the kitchen area so a lot of traffic and chatting with wait staff. This was so disappointing! We booked a breakfast reservation for 10:30 on a Sunday morning. When we got there, they told us that they are now closed from 10:30 to 11:00 to get ready for brunch. We were not happy! We couldn’t wait because we had a plane to catch. We spoke to the manager who talked to the dining room and they said we could be seated and they would begin serving us the first courses of the brunch. We sat for over 10 minutes and no one said hello or acknowledged us in any way. We finally got up and left! We have wonderful memories of visits to this beautiful place from past experiences. Unfortunately, we will not go back! Our luncheon was tasty and the ingredients were fresh and well prepared. 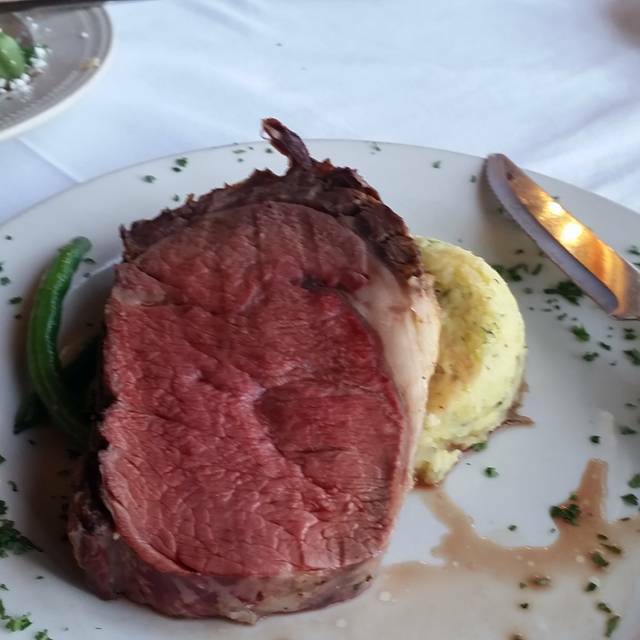 Dessert looked great but was hard.Prime rib a little tough. Great historic place! Great Sunday brunch. Michala, our server was very gracious and engaging. Presentation is superb. 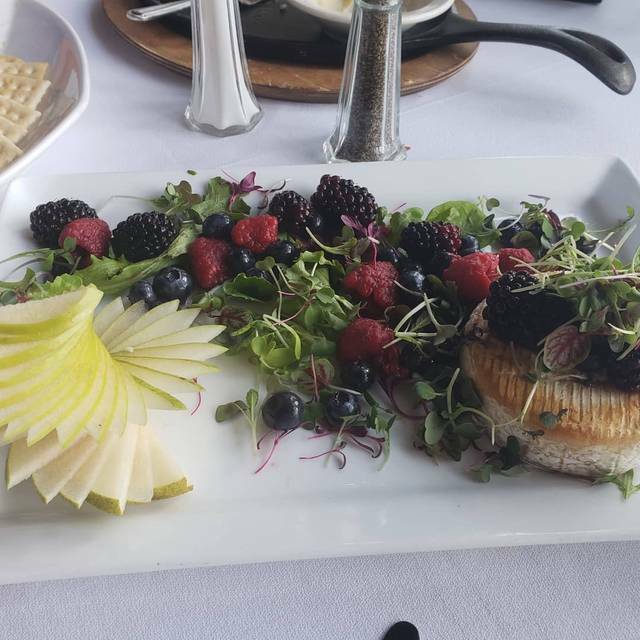 Brunch offers mimosa with champagne or apple cider; Yogurt parfait served in champagne glass; assorted fruits, small pastry, cheese & crackers. Also included is an entree and s selection of small bite desserts. Brunch is served on Sunday 10:30 - 2:00 and is reasonably priced at $32 pp. 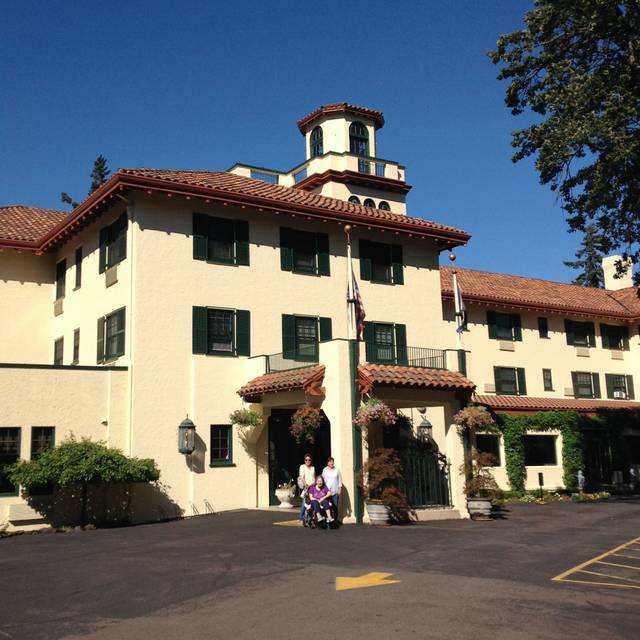 Columbia River Gorge Hotel and Simon’s offer a beautiful view of the Columbia River and the Gorge. Highly recommend—worth the drive! Great food, great service, classic surroundings, super view. Extraordinary experience, Gabriel and the other staff we amazing, the food and service were out of this world! We had breakfast. The setting is lovely. The device was friendly and gracious. The fruit cup that came with my order was wonderful with berries and melons. We enjoyed the experience. The one man band was soooooo bad and soooooo loud I couldn't even tell you what we had to eat. Wont be going back ! The service was slow and they food was horrible! Our steak was the worst we’ve ever had! Service was non existent ... food of banquet quality. Don’t go. Went for the Sunday brunch. The service was good. The food overall was disappointing. I remember the 7 course brunch of many years ago and this is not remotely similar. Yogurt was very sweet (peach flavored). The cheese plate was sliced supermarket cheese, the fruit was ripe but a blackberry had mold. Busicuits were good; the scone was good, however chocolate chip was not the best choice to complement the fruit and cheese (served at the same time). Mimosa’s had fresh orange juice but little champagne. We had to ask for coffee. We only had our water filled for the first time at the end of the meal. The chicken pot pie was good. I would not recommend for brunch. We left disappointed and longing for the good old days - when fresh tayberrys were served with the waterfall of honey that is still touted on the menu but not served. My sister and I took a quick trip from Portland out to Hood River to pick up my wine shipment and wanted to have lunch somewhere with a view. This place certainly delivered. First off - Joel, the seating host was phenomenal. Great energy, attentive, accommodating, and excellent table side demeanor. Our server was polite, informative, and didn't bat an eye at my sister's special request for her sandwich. All of the food we had was very tasty (sandwiches and salad) and we enjoyed our Pinot Grigio. Great experience here, we'll certainly return! Food was Ok. Service was terrible. Priced a little high for what they offer. Nice historic location. Maybe a better place for a drink and a quick bite on the patio. We were treated wonderfully and fed well during a 12 person get together with family and friends. Thank you Tim & Corey.